The first few years we were married, the Hubs was always shocked when I served rice with dinner. We were having chicken for dinner? Rice goes with that. Add a little gravy and you’ll see. Tacos or quesadillas for dinner, rice goes with that too! I’d just make it my famous yellow basmati rice. Rice goes with almost everything friends. Or at least it did in my house growing up! I seem to have carried on the tradition without even trying. For me, rice goes with just about anything. I mean white rice is so adaptable. It’s literally a perfect side dish. Universal really. 100% why I love it so much, and probably why my Grandma & Mom did too. It takes the guess work out of cooking. How many times have you spent wondering what’s for dinner? You’ve probably settled on, or at least considered, an entree- but what to do about sides? We’ve got to serve a meal to the family after all. Good ol’ rice, always there to save the day. Sometimes white rice is a given. If you have a sauce laden dish, it’s perfect to serve because it will soak up any juices absorbing the flavors. Or it can be made in a way that pairs perfectly with the dish you’re dying to enjoy. 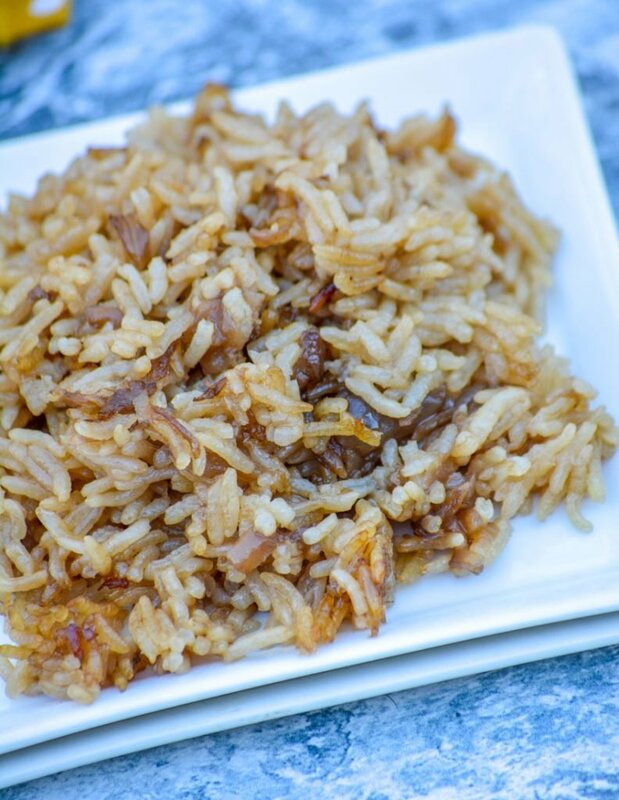 Sometimes though, rice can be and is meant to be the star of the side dish show all on it’s own. Nothing’s a better example of this than our stick of butter rice. 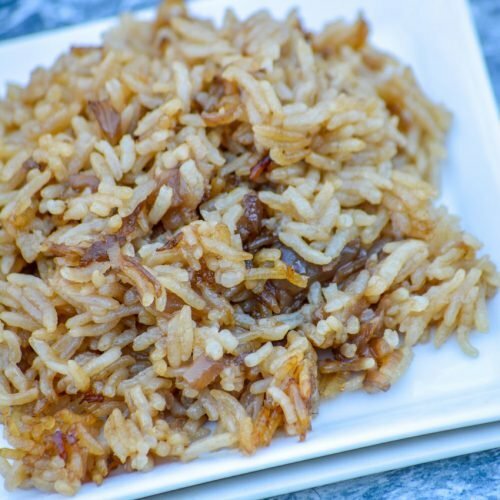 A simple ingredient list is all that stands between you & a gorgeous golden brown heavenly tasting rice laden side dish. Five ingredients are all you need. Seriously, five that’s all. 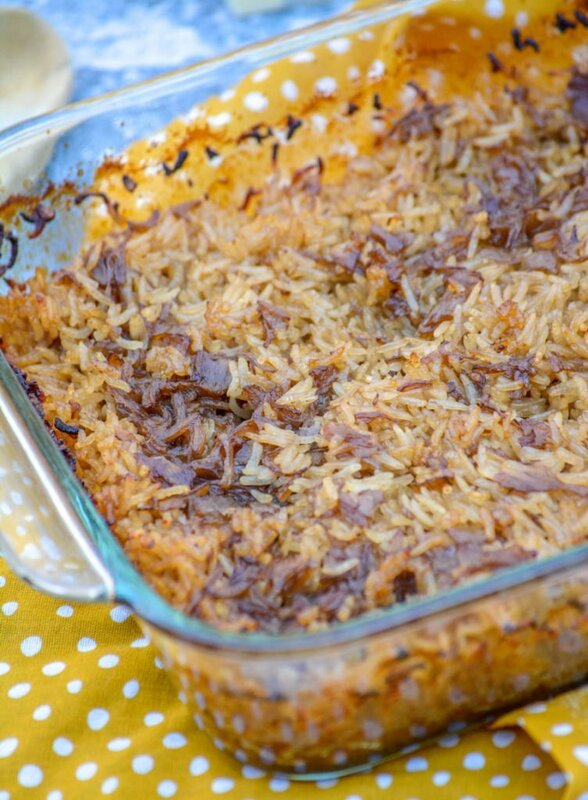 Jasmine rice, one can of French onion condensed soup, one can of condensed beef consume, a stick of butter, and a dash of Worcestershire sauce- that’s all you need. 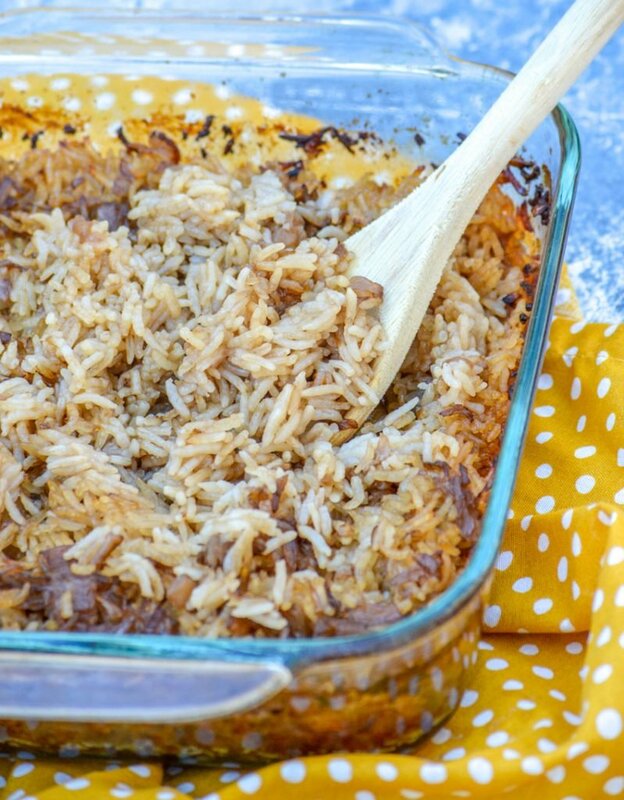 The ingredient list may seem small and it’s simple, but it makes for crazy flavorful rice. My favorite part is that it also cooks all in one dish. It makes it so easy! It’s like the one pot meal equivalent on the side item menu. Remember when I said just a second ago that this was the one pot meal of side dishes? I wasn’t kidding. Start by lightly greasing an 8×8″ baking dish with non stick spray. Spread the rice evenly out over the bottom. 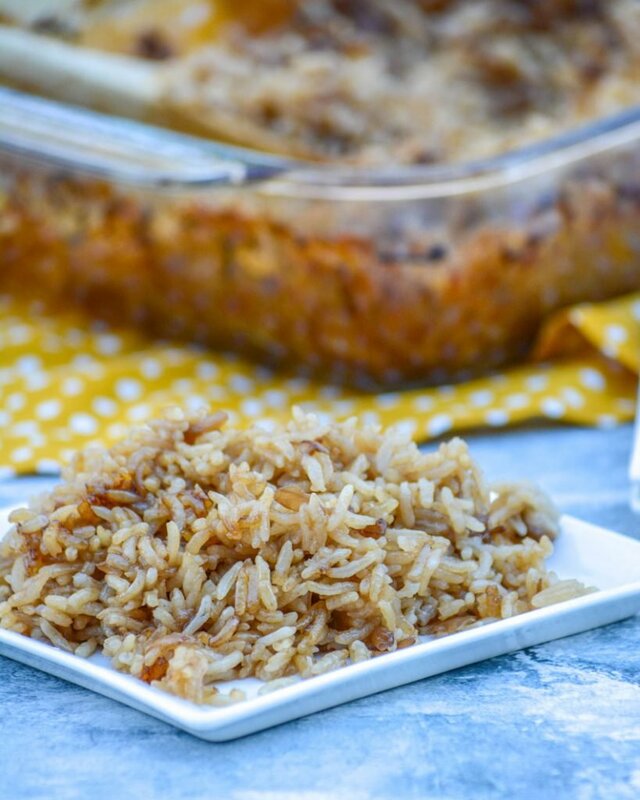 The recipe calls for jasmine rice, but basmati also works just as well. Empty both cans of condensed soup into the dish, then sprinkle the Worcestershire sauce over top. Place the pats of butter evenly out over top of the mixture. Next cover the dish with foil pressing it tightly all around to seal. A tight seal is important. It’s crucial to the dish turning out. Bake the stick of butter rice at 425 degrees for 45 minutes. No matter how tempted, don’t open the oven or peel back the foil and peek. Remove it from the oven, take off the foil, and bake another 15 minutes. That’s it, that’s all it takes to make the ultimate rice. I told you, simple. Change things up, and kick boring white rice to the curb. Don’t just serve it with sauce served over top. 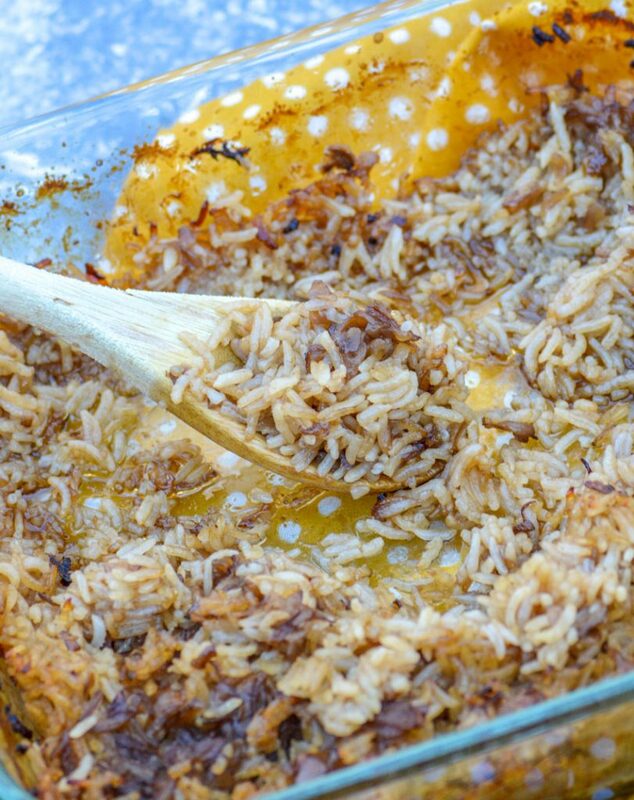 Make stick of butter rice, and bake sweet savory flavor into every single grain. It’s easy enough for any night of the year, but fancy enough for any occasion. 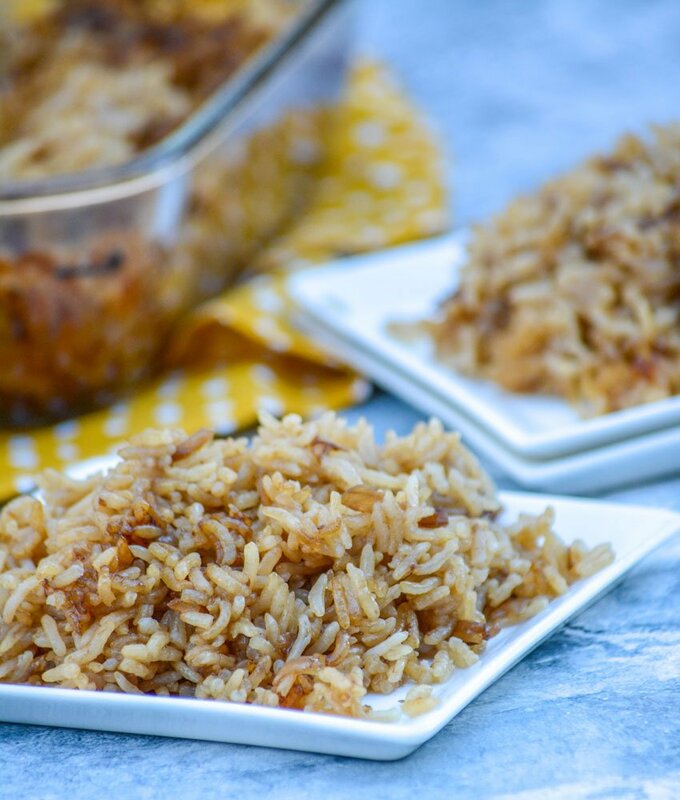 A simple rice dish, this one's infused with an abundance of savory flavor and uses only 5 ingredients. Lightly grease an 8x8" baking dish with non stick cooking spray. Spread the uncooked rice evenly out over the bottom. Empty the cans of condensed soup evenly out over top. Sprinkle the Worcestershire sauce out over top. Place the pats of butter evenly out over top of the rice mixture. Cover the dish tightly, sealing it with aluminum foil. Bake at 425 degrees for 45 minutes. Remove the foil from the dish, and bake an additional 15 minutes. Let the dish rest 2-3 minutes before serving. This is my kind of recipe… simple!! We love rice with our dinners too! And I have all of the ingredients in my pantry…. 🙂 I’ll be trying it soon and let you know how it went. Thanks! I can’t wait to hear back, Tess! Does it have to be jasmine rice? We usually use California Rose white rice. Just wondering if that would cause a problem. No it doesn’t. We’ve also used basmati. I’m not familiar with that particular brand, but if it’s a rice with a similar cooking time to the recipe then it should be just fine. Enjoy! Ooohhhh, this sounds absurdly delicious! Have you tried doubling the recipe? I have a 14×10 lasagna pan and think it’d be perfect for a double batch! I haven’t before, simply because I haven’t needed to- but this recipe can easily be doubled for a crowd. Your lasagna pan, or even a 9×13 inch baking dish, should work well. Raw or cooked rice ? Never mind – I see it in the instructions ! If you wanted to make a whole pan meal, could you add porkchops or chicken to this? What would you have to add to do that? Just wondering, it sounds delish. You could add either. You may need to let it finish cooking uncovered for a few minutes though. This was delicious and so easy. Even my son who doesn’t like rice enjoyed it. Don’t you love it when you find something so simple & easy that’s even picky eater approved? !